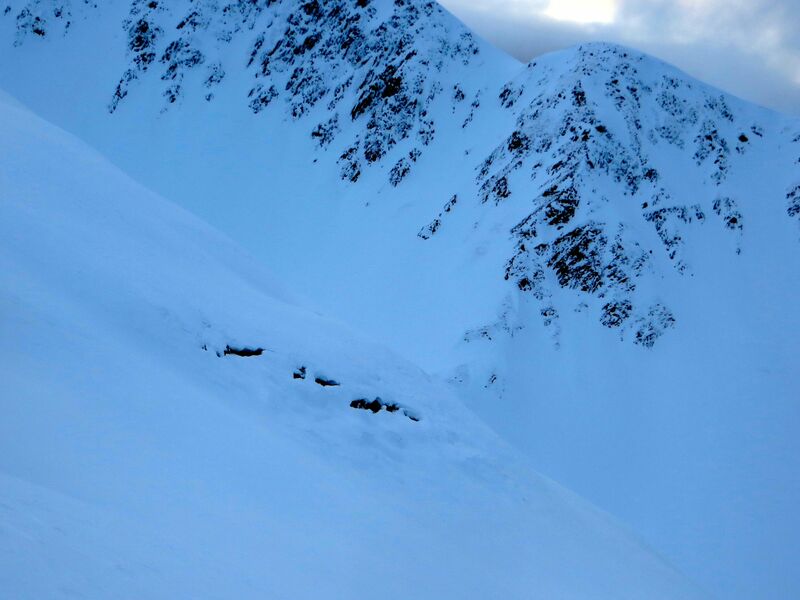 A LOW avalanche danger exists at all elevations in the mountains surrounding Turnagain Pass. From ridgetop elevations (3,300-3,800') and below the snow surface is capped by a variable and semi-supportable crust. Triggering an avalanche today will be unlikely. The one exception will be areas of MODERATE danger above 4,000' in the Girdwood Valley where 5-12" of snow fell Thursday and may be poorly bonded to the old snow surface. The main hazard in the backcountry will be slick and hard surfaces along with - I hate to say it - low snow cover issues such as rocks/alders/stumps/creeks/etc. Will winter ever arrive? We are not short on precipitation, just cold temperatures. Another very warm and windy storm blew through on Thursday. The rain/snow line was around 3,000' in most areas which saturated the snowpack and removed much of the snow below 1,500'. Above 3,000', the warm temperatures and wet snow melted the surface up to ridgetops and a supportable crust exists at these higher zones. At the mid elevations the crust was unsupportable and our skis were punching through to wet soft snow easily yesterday. Overnight, with mostly clear skies, the crust at these mid elevations is likely to be a bit more supportable and hard. On the bright side, it was snowing at the very high elevations in the Girdwood Valley - this will be the one possible exception to the LOW danger for today. At elevations above 4,000' a possible 5-12" of storm snow may be found. How well this has bonded to the old surface is uncertain. We do know there was surface hoar prior to Thursday's storm - whether it was destroyed by the high winds or buried intact is the question. If you are headed to these high elevation slopes, assessing the recent storm snow, how it is adhering and looking for buried surface hoar underneath will be key. On another bright side, in the Alpine zone (above 2,500') our old and buried weak layers, which were very stubborn and difficult to trigger prior, are even more difficult to trigger as the slab is capped with a stout crust in many places. An avalanche failing in these old persistent weak layers is unlikely. Photo below: A 1-2" crust caps the snowpack up to 3,500' on the Magnum Ridge. Glide cracks are opening up a bit more with the recent warm temperatures. We saw a few of these on the Southeast face of Seattle Ridge (mid-slope), Eddies headwall, North side of Todd's run on Tincan and on the Southerly slopes on Magnum. Will these cracks avalanche? There is no way to tell. These kinds of avalanches are very unpredictable in their nature. It is best to avoid being near or underneath them, or to limit your exposure, as a general rule. The photo below is a series of glide cracks in PMS Bowl on Magnum from yesterday 1/9/15 (SW facing, ~2,800'). Yesterday saw the tail end of Thursday's windy, warm storm move out. We have had no additional precipitation in the past 24-hours yet temperatures have been WARM. Ridgetops are still hovering around freezing (32F) while low and mid elevations are in the mid 30's F. Winds have been on the decline as well and are averaging 5-8mph from the East this morning. Today, mild conditions are in store. We can expect mostly clear skies with light Easterly ridgetop winds in the 5-10mph range. Temperatures look to remain near 32F on ridgetops and in the mid 30's F below 2,500'. Sunday should be another mild day before another warm and windy storm rolls in Monday and into Tuesday. This system looks to be similar to the last - rain up to 2,500-3,000' - with light amounts of precipitation.